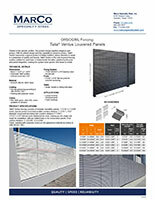 Thanks to the specific profiles, this product brings together elegance and privacy. With its refined design and the capability to preserve privacy, Talia® Ventus represents a typical product of Italian tradition, where attention to detail is a guarantee of quality and beauty. 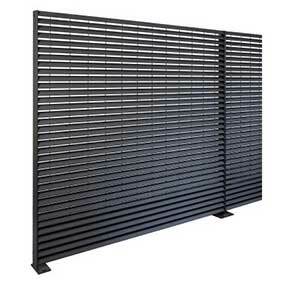 Talia® Ventus fencing consists of modular monolithic panels, 1 13/16″ x 5 13/64″ mesh, special section horizontal profiles (center distance 1 13/16″), 5/32″ diameter round vertical joining bars (center distance 5 13/64″). 3 5/32″ x 5/16″ flat bar posts welded at the ends, making up one single unit ready for installation, with pre-drilled holes to fix consecutive panels. Post center distance: 5′-4 61/64″- 6′-6 47/64″ Finish: painting with polyester resins on hot galvanized material according to UNI EN ISO 1461.